Spread bread on both sides with butter. Beat eggs slightly. Add milk, sugar and salt. Blend well. Dip bread in egg-milk mixture. Place on moderately hot waffle iron; bake until browned. Delicious with lots of Log Cabin Syrup. This vintage recipe is from a 1955 Log Cabin Syrup magazine advertisement. 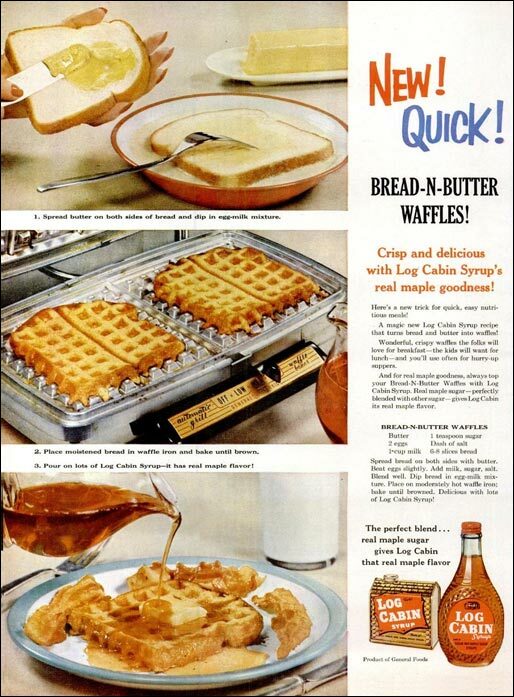 "A magic new (in 1955) Log Cabin Syrup recipe that turns bread and butter into waffles! Wonderful, crispy waffles the folks will love for breakfast - the kids will want for lunch - and you'll use often for hurry-up suppers." Is it a waffle? Is it French toast? It's both! Two breakfast favorites join forces in this classic recipe. Recipe number 3060. Submitted 10/19/2011.